We are showing a total of 120 discount Speedplay Pedals, with an average saving of 20% across the range. There are savings ranging from £6.00 for the Speedplay SYZR Cleat Set at Chain Reaction Cycles, up to £165.00 off for the Speedplay Zero Pave Titanium Pedals available at Wiggle for £334.99 and the same percentage saving for the Speedplay Zero Pave Titanium Pedals from Chain Reaction Cycles at a sale price of £334.99. The top percentage discount is 50.00% for the Speedplay Frog Mtb Titanium Pedals at Cyclestore, giving a saving of £150.02 reducing the price from £299.99 to £149.97. This level of discount is also available at the following cycle shops: Chain Reaction Cycles, Cycle Surgery, Cyclestore, Evans Cycles, Probikekit.com, Wiggle, for example giving a saving of £75.0 off the Speedplay Zero Track Special Road Pedals at Chain Reaction Cycles for a sale price of £124.99. We've found discounts on 20 pedals in this model range, with the price for the Speedplay Zero Pave Titanium Pedals giving the largest reduction at 33% off, available from Wiggle and saving £165.00. The saving of around £165.00 is available at more than one retailer. and the top percentage discount is also for this model at Wiggle. This level of discount is also available at the following cycle shops: Wiggle, for example also giving a saving of £84.99 off the Speedplay Zero Aero Titanium Track Sprint Pedals at Chain Reaction Cycles for a sale price of £290.0. 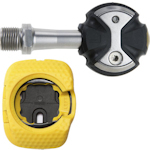 There are discounts available for 25 Speedplay Light Action Pedals, with the largest reduction being 26% off the Speedplay Ultra Light Action Titanium Clipless Pedals:Pink:O . This is available from Wiggle at a price of £274.99, saving £100.00. The saving of around £100.00 is available at more than one retailer. 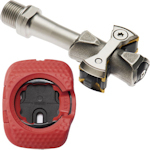 and the top percentage discount is 27% for the Speedplay Ultra Light Action Cromoly Pedals - Walkable Cleats - Red at Probikekit.com. This level of discount is also available at the following cycle shops: Probikekit.com, for example also giving a saving of £100.0 off the Speedplay Ultra Light Action Titanium Pedals at Chain Reaction Cycles for a sale price of £274.99. There are 23 pedals in this range currently available at discount prices, with the top saving giving 28% off the Speedplay Zero Pave Stainless Pedals - Walkable Cleats at Probikekit.com reducing the price by £84.70. The saving of around £84.70 is available at more than one retailer. 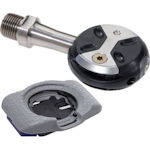 and the top percentage discount is 28% for the Speedplay Zero Stainless Pedals at Wiggle. This level of discount is also available at the following cycle shops: Wiggle, for example also giving a saving of £55.2 off the Speedplay Zero Stainless Pedals - Walkable/Aero Cleats - Celeste at Probikekit.com for a sale price of £144.79.